If anything threatens, or lessens our feelings of security and comfort, our will body react in a way that helps us either fight and destroy the threat, or run away to escape it. Scientists call this bodily reaction to feeling threatened 'the fight or flight response'. If this response happens often, it has a detrimental effect and can seriously rob us of happiness and health. Over time, this physical response to stress, speeds up the rate of wear and tear, and ageing of the body and makes us more vulnerable to many illnesses. All sorts of situations can make us feel threatened every day. Most of us have felt the fear of a narrow escape when driving, or insecurity when a friend lets us down. Many of us regularly experience the effects of mild, or even intensely stressful situations. Some people report that they are mostly always tense and seldom feel really safe, secure, and relaxed. The fearful feelings of anxiety, guilt, panic and dread that we experience when tense, are part of the fight or flight response. To be happy and relaxed we need to understand the fight or flight response and learn when and how to calm it down. Practicing meditation gives us both the understanding and the skills to calm body and mind. Research has shown that the practice of meditation creates a different response in the body, the very opposite response to the fight or flight syndrome, scientists have called it 'the relaxation response'. And what is so good about meditating regularly is that an experienced meditator can switch on the 'relaxation response' and switch off the 'fight or flight response' whenever they want to. If we are faced with danger, a real danger such as seeing a poisonous snake, or even an imaginary danger, such as mistaking a coiled up piece of rope in the shadows as a poisonous snake, our nervous system leaps into action. An area in our brain called the hypothalamus tells our pituitary gland to inform the adrenal glands to produce the hormone adrenaline. At the same time the other sympathetic nerves in our body secrete noradrenalin. Our endocrine system secretes hormones directly into the bloodstream to give us the energy to fight or flee. Vasopressin constricts blood vessels, endorphins suppress pain so that we can fight or flee without being stopped by pain and thyroxin increases our metabolic rate. Adrenalin and glucocorticoids cause the liver to flood the blood stream with glucose, giving us the fuel we need to fight or flee. Normally we can feel these changes occurring, our body temperature increases and we feel hot and perspire, also our breathing pattern changes as our oxygen consumption increases speeding up our breathing rate. As the metabolic rate increase in the cells, we feel agitated and shaky. This response to stress also produces a huge range of other effects. It has been described as the body acting like a nation at war, diverting resources from less important services to the battlefront. Indeed that is exactly what happens, for example our digestion slows down, our immune system slows down, and the process of energy storage and the functioning of our reproduction system, amongst other things, switch off. Dealing with the threat to our security, be that a real or imaginary threat, becomes priority for the body. All these processes prepare the body to fight, or escape from whom, or what, caused our experience of stress, worry or fear. The fight or flight response is programmed in each of us to make sure we survive and feel safe and secure. It works quickly and efficiently without us even thinking about it. Its purpose is to save our life and keep us safe. The response itself is not a problem. Should we ever be really under an immediate threat such as facing a tiger, or a mugger, an efficient fight or flight response will help us out, and hopefully save our life. In real danger the fight and flight response quickly provides the necessary resources to conquer, or escape. Once all the fight or flight chemicals, nutrients and hormones are used up by fighting or fleeing, the now safe and secure body/mind calms again. This system worked very well for early humans who actually faced real dangers on a regular basis. They needed to fight or flee from tigers, wolves and other life threatening situations. However when we modern humans get stressed we set off the same reaction in our body, yet we do not have the same opportunity to fight or flee from the causes of our stress. The things that cause us stress are different. We cannot fight someone on the street for stepping on our toes, or run away from a unexpectedly high credit card bill. But still we have the same internal physical reaction. The fight or flight response that once saved early humans, now sometimes becomes the enemy of us modern humans. Over time the chemicals set off by the fight or flight response can slowly cripple us from within, simply because we are living a completely different lifestyle to our hunter gatherer ancestors. Our fight or flight response is out of date and not caught up with how best to deal with often milder, but more frequent stresses we experience in our lives today. Because of this out of date system, we can find ourselves becoming stuck in an agitated, or stressed out state. We discover we still get upset when feeling our sense of safety being threatened, maybe by losing a partner to another, or losing a job, or simply by feeling inadequate in a competitive environment. However for us to survive in our modern world we need to be accepted by society and so it doesn't work to physically fight, or turn and run from the people, or situations that upset us. That means that the chemicals released by the fight or flight response, creating anger to encourage us to fight, or fear to encourage us to flee, are not used up and instead they hang around our system sustaining fearful or angry emotions and anxious thoughts. This is a problem for all of us. It can be that we calm down a little, but often not back to the fully relaxed state. Instead we stay in a place of lower, but chronic tension, that can eat at us all day, or even longer. Our modern human lifestyle creates chronic tension, which means we feel scratchy and then tend to get stressed out at the slightest irritation. Our body/mind can be wound up sometimes for days, weeks, even months, or a lifetime! Scientists call it 'simmering stress'. We need (without getting over anxious about it!) to learn how to master the controls of our own bodies, because too much stress, for too long, can be very detrimental to our health. High blood pressure can give rise to heart disease, kidney failure and respiratory failure. High metabolic rates can result in fatigue and cell damage. Muscular tension can lead to physical pain and injury. Constricted respiration and heart functioning can lead to asthma and lung infections. Reduced blood supply to the digestive system and excess hydrochloric acid in the stomach can produce a range of gastrointestinal problems. The immune system, which protects us from infection and disease, seems to suffer the most under chronic stress. A poor immune system affects everything, in particular allergies, arthritis, asthma and cancer. Even most back ache is caused by stress. It is important to often ask ourselves the questions "Is my body in a stressed state? Do I need to relax myself more?" Because while the fight or flight response is not a health problem in itself (all animals need it for survival), we do really need to recognise that to be stressed when necessary is good, but only when necessary, and only short term, as soon as possible we need to return to a relaxed state. Meditation is the answer. If our body is stressed out, we can turn that around within minutes. Meditation does just that. Meditation relaxes the body. There are many ways to learn to relax; progressive relaxation, breathing techniques and visualisations are just a few. Sitting meditation has been researched thoroughly over the years and the results are very good. Meditation will teach you how to activate the relaxation response where and when you need it. Research has shown that those who meditate regularly can, when stressed, not only return to a relaxed state more quickly, but also do not get so agitated in the first place. A meditator's body is less responsive to noradrenalin. Because meditation relaxes our body, our mind also calms down, during meditation our whole being is in a self-healing state. Meditation creates 'the relaxation response'. The relaxation response is the opposite to the fight or flight response. It causes a steep drop in metabolic activity, reducing blood lactic acid levels and muscle tension, slowing breathing and lowering high blood pressure. It creates a shift from faster beta brain waves to slower alpha, theta and delta waves giving the experience of peace. We can often experience the relaxation response occurring as we meditate, muscular tension is reduced and we feel our body softening, our breathing changes indicating a slower metabolic rate, we feel warmth or tingling on the skin, showing blood returning to the surface, often we notice more saliva or tummy rumbling as the digestive system returns to normal. Meditation is the perfect antidote to stress. Too much stress has us feeling angry and tired. And worse still, over years it can cause illness and premature death. Meditation may not make us blissfully happy every moment of our life, but even a short session, that perhaps seemed a bit flat, will still lower our physical and mental tension. Research shows that lowering our stress levels even by five percent could prevent illness and add years to our life. Daily meditation is perfect as a life enhancer by keeping us more youthful, energised, healthy, happy and alive for longer. It does us good and makes us feel good. Why then isn't everyone meditating? Why do we find it so difficult to practice? There are obstacles to overcome before we can gain the benefits of meditation. Because we are so familiar with the speedy tense 'stressed out' state, we feel uncomfortable about slowing down. It feels as if it is going against our survival system. It feels that way because through the pressure we are put under by society and our families and ourselves, we seldom take our finger off the alarm button. We can quite easily get into being 24/7 anxious! Try telling someone to slow down, sit down, and take a few deep breaths when they have high alert screaming inside them! It feels wrong to waste 'essential fighting, or escaping time' just sitting on a cushion dropping thoughts of potential danger and doing what can seem like a boring and mundane task of following each breath. We soon come to face, when sitting to meditate, the fact that we are inwardly tense and have painful emotions. We are all familiar with feelings of disappointment, failure, inadequacy and resentment, although we normally try to avoid noticing them. To sit for five minutes faced with these negative emotions is hardly relaxing! Our negative emotions contain a tension that makes us want to do something active because they fire off the fight or flight response. Trying to avoid anything uncomfortable is often our biggest obstacle to having a happy life. Creating the relaxation response, can make us feel a lot better emotionally, giving us a brief mental/emotional rest or holiday. Yet meditation can be far better than that…. After a while, we can, during our meditation practice, calmly look at the distressing emotions such as anger, or sadness. We can, while sitting quietly, take a step back from them, noticing that all thoughts and feelings come and go without us having to act upon them. In this way we learn to detach more and more from our previously uncontrolled negative emotions and allow our more reasoning mind to steer our life. By sitting regularly we can learn to be relaxed in the middle of life, rather than needing to fight it or escape it. Meditation teaches us to watch and know ourselves. Watching allows us to notice our stress signals such as a headache, or a churning sick feeling in our stomach. Awareness of our body responses to life means that we can calm ourselves, thus immediately lowering stress levels. By watching ourselves we also learn what our habits are, and understand ourselves more. We notice where we set off our 'fight or flight', what things 'get to us', and where we over react. How many ropes do we mistake as poisonous snakes? This observation and insight, that only meditation can teach us, gives us information to prevent further distress. We realise things about our self we simply hadn't seen before, mostly because we were too busy being stressed and scared about our well being. Sitting often shows us our strengths. Most meditator's report feeling much happier about themselves and far more self reliant than they did before they practiced regular meditation. The main benefit of meditation is to know ourselves, to 'Self Realise' (to Realise who our Self is). At a deeper philosophical level we begin to realise that we are not the body, or the mind and its emotions. We can see the unity of all life. Such seeing dissolves worry. It is important to acknowledge that meditation takes practice. Certainly we need to be patient. Just as in learning to do anything, such as learning to speak a foreign language, or drive a car, or play an instrument, we are faced with our inability at first. It can all seem so frustrating and therefore more stressful. But if we are prepared for initial feelings of inadequacy and are willing to watch those as well, and then keep plodding on, we will reap the rewards of becoming an experienced meditator. Patient perseverance is the key. It might not be easy but it is certainly worth it. Regular meditation makes each moment of our lives sweeter, richer, and more worthwhile. The alternative is not so happy. A tense life is not much fun. Being tense means living with an aching body, or feeling tired a lot, or ill. Being tense means living with a fearful mind, often anxious, angry and resentful. Meditation takes just a few minutes, maybe half an hour each day. But the results stay with us always. A recent study showed that experienced meditator's were happier and more satisfied, not only during their meditation period, but were also more accepting and content throughout the day. Imagine what the world could be like for human beings, if we all sat quietly and meditated for just twenty minutes each day. Peace really does begin with me! Another teaching from the 15th century, called The Hatha Yoga Pradipika, warns students to refrain from certain foods claiming they are 'injurious to health', and encourages consuming other types of food for well being. And while some of the advice from the Hatha Yoga Pradipika is not in agreement with modern suggestions for healthy eating, the basic idea of being aware of our diet and of eating for 'well-being' was and still is an important part of yoga practice. Yogins are advised to create a sattvic lifestyle by eating sattvic foods, keeping sattvic company, and thinking sattvic thoughts. In this paper on yoga diet, while explaining food in the traditional yogic terms of the three gunas I have also included the latest scientific research and advice on which foods are best for health and well-being. Buddha taught that life is constantly changing and that includes advice on healthy eating. Nutrition is a fairly new science and is often making new discoveries; please check out the latest information, because eating well is essential for good health. Eating foods that are over ripe, or heated up too many times. What happens to us if we eat too many tamasic foods? Tamasic is the state that yoga practitioners try to avoid the most. That refers to within as well as around us. The yoga masters suggest that if we decide that our lifestyle is too tamasic we need to adopt a more rajasic way first and then gradually develop a more sattvic life. Tamasic foods withdraw our energy; make us more lethargic and vulnerable to disease. Our mind also becomes more negative. Eating too many tamasic foods is harmful because they create tiredness and a stuck feeling of being unable to move forward. Eating too many tamasic foods makes our thoughts become negative, and we feel despondent. The body's resistance to disease weakens and we can become overwhelmed by minor illness and negative emotions such as inadequacy. Through over-consumption of tamasic foods our body becomes stiff, tired and prey to viruses and infections. Life can feel like an uphill struggle. Of course we can experience different degrees of tamasic qualities, depending on how much food and other tamasic aspects affect our lifestyle. Tamasic foods include meat, and perhaps eggs. Not all yoga practitioners, or even all yoga masters are vegetarians. Some yoga masters consume small amounts of meat, eggs and other tamasic foods. There are several reasons that may explain why the old yogic texts describe meat as tamasic. Years ago there were no fridges and food poisoning was a common problem. Perhaps the advice to refrain from eating meat and eggs was to avoid food poisoning. Health is important to yogins. Most often the yoga diet is lacto vegetarian which recent scientific studies are showing to be the healthiest diet. Following it we are less likely to suffer from heart disease, cancer or many other physical problems. Some yogins choose not to eat meat for other reasons, such as the practice of tapas or austerity. Tapas involves doing something difficult, to strengthen self-discipline. When we have solid self-discipline, we can extend our boundaries and break through our limitations. Yogins also believe in ahimsa, which means non-violence. Many yoga practitioners make an effort to avoid causing harm to other creatures and so choose not to slaughter animals for food. Others yogins are concerned that a slaughtered animal would have died in fear so its body would be full of fear hormones. They do not want to eat meat full of stress chemicals. Some yoga practitioners are vegan. A vegan diet requires careful planning to ensure balance. If you are considering becoming vegetarian, before you make the change I suggest you explore the scientific evidence of the value of being a vegetarian. Overeating is tamasic. It is inevitable if we eat a lot of tamasic foods that we will also overeat, because tamasic foods cannot fully nourish us. Undernourished, we feel lethargic and tired so we try to perk ourselves up by eating. We sense that food gives us energy and will lift us. But because we desperately need a lift of energy we are attracted to the 'quick fix' tamasic foods. We desire the fast glucose release that comes from consuming alcohol or over processed foods. .Practising hatha yoga regularly helps us avoid too many tamasic foods. Of course it is important not to be too fanatical about anything. The middle path is always the best path. Yoga masters often say that in a healthy body and mind, a small amount of tamasic food occasionally will do little harm. The experienced yoga practitioner will have enough tapas/self-control not to over-indulge. The more we practice yoga, the more sattvic we become. It normally happens naturally. Stimulants such as coffee, tea and chocolate Fish was considered rajasic but more recently is regarded as a healthy food for the brain. Fish consumption requires caution during pregnancy. Eggs are sometimes referred to as rajasic Caution during pregnancy. What happens if we eat too many rajasic foods? The rajasic state isn't nearly as harmful as the tamasic one, and it is fine to include some rajasic foods in our diet. But too many, too often, will stimulate the body making the mind restless and frustrated. Rajasic foods destroy the harmony between mind and body. Rajasic foods are the ones that cause anxiety. We are more likely to be tense or agitated after eating these foods. Agitation can prevent us from settling into relationships, jobs, or even being with ourselves. The mind/body balance is upset, with the body over-active and the mind going round and round in circles. Insomnia is a rajasic state, as is constantly talking and worrying, the consumption of too many rajasic foods can have us living on our nerves, as anyone who has drunk too much coffee will know! Therefore if we want to eat these foods, we need to do it with awareness of their effects. Again the rule of the moderate pathway is called for. A little of what you fancy may do you good but a lot of rajasic or tamasic consumption can do you harm. Eating too fast or in a hurry is rajasic, and has negative consequences on the digestive system. In yoga we are encouraged to be 'in the present moment' and to slow ourselves down in order to meditate on the' here and now'. To gulp our food down would mean that we are not focused on the process of eating and of nurturing ourselves, or caring for ourselves in a positive way. We need awareness to notice what we are doing to ourselves. Only then can we avoid our harmful habits and strengthen our healthy behaviour patterns. To rush food means we are not watching our body's needs, awareness is not possible if we are on the run. Low-fat Cheese, caution, no soft cheese, during pregnancy. What happens if we eat sattvic foods? Sattvic foods are the purest and are for any yoga practitioner who is interested in eating for health. These foods nourish the body and maintain it in a balanced state. 'We are what we eat' is literally a true statement. The Taittiriya Upanishad tells us 'Verily, this person consists of the essence of food'. Our bodies are made up of the food we eat. We are taught in Yoga that the food we put in our mouths not only affects our body but also our mind. A sattvic diet calms the mind and helps us to feel the best we can psychologically as well as physically. Just as tamasic and rajasic foods can have an effect on our behaviour, so can a pure, natural sattvic diet. 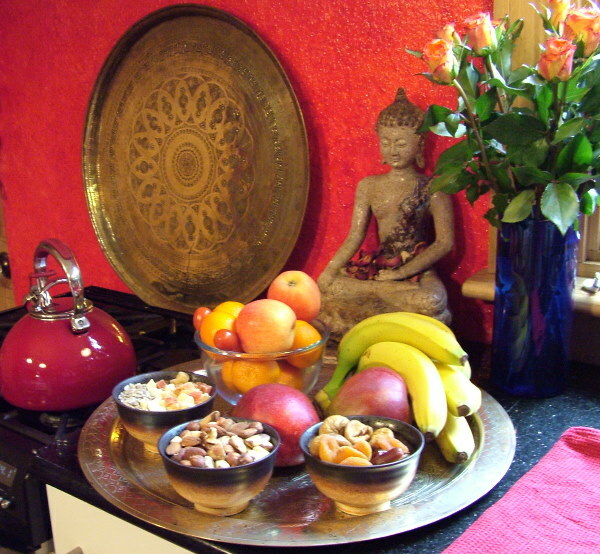 The sattvic diet contains the most prana and so makes us joyful, compassionate and energised. The yogic way of eating is quite simple. A sattvic diet is as natural as possible, including fresh, light, nutritious foods such as fruits, grains and vegetables. It keeps the body strong and energised and the mind happy and clear. We need certain foods to make and keep us healthy: proteins to rebuild the body; fats and carbohydrates for energy; vitamins and minerals to stimulate the production of certain hormones and enzymes to prevent disease. In recent years the medical profession and scientists have become increasingly interested in the effect food has on our health. The World Health Organisation recommendation of a healthy diet is very similar to a yoga sattvic diet. They suggest that we cut down on the amount of meat we eat, and instead consume more vegetarian protein foods such as pulses; cut down on saturated fats and use low-fat dairy products, and cut down on all sugary foods such as cakes, biscuits and sweets, and instead eat dried fruit such as sultanas, dates and nuts. They advise that we eat less processed foods and less fast food and instead eat at least five portions of fruit and vegetables every day, drink plenty of fluids, and cut down on the consumption of tea, coffee and alcohol. The ancient yogic teaching that what we eat affects our well-being is validated by the scientists of our own time. Eating moderately is sattvic. The Siva Samhita states, 'Let the yogin eat moderately; otherwise, however clever, she/he cannot gain success'. The Hatha Yoga Pradipika says moderate diet is defined to mean 'Taking pleasant and sweet (unprocessed) food, leaving one quarter of the stomach empty and with thanks to the universe'. To eat slowly, mindfully, with appreciation of our food is the sattvic way. A sattvic diet gives us energy, a clear skin, a firm, strong and fully functioning body. It gives us a light step; we feel in touch with ourselves and comfortable in our body and mind. With little or no conflict, we work in harmony on every level of our being. Our emotions are more stable. External disturbances do not so easily upset us. We feel grounded and centred. We can sleep well, and wake feeling refreshed. We can tackle the challenges of life with stamina and a clear head. We feel agile and have a zest for life. Once we have experienced the effects of a sattvic diet we are not so tempted by tamasic or rajasic foods. We become so finely tuned we can detect their inharmonious effect upon us almost immediately. Most people find that with regular, hatha yoga practice they become naturally drawn to a more sattvic lifestyle. Make one day a week a sattvic day. Eat moderately with appreciation and only sattvic foods. Be aware of the tamasic foods you eat. If you are overeating, try to eat a little less. Be aware of the rajasic foods you eat. If you are rushing your meals, try to slow down a little. Be aware of the effects rajasic and tamasic foods have on you. Do not eat when angry. Wait until you feel calm again. Chemicals that upset digestion flood the body when we are angry. Try not to overeat but equally do not under eat. It is important not to become obsessive about diet. Work on avoiding tamasic foods as much as possible, and limiting rajasic foods. Make one meal a day sattvic, perhaps breakfast. After a month or so add lunch. Then when you feel ready make your main meal sattvic also. whole grain cereal with low fat milk. Low fat yogurt with fresh fruit. Fruit juice or fruit tea. bake: aubergines, sweet potatoes, courgettes, red onion with a tomato and vegetable sauce and pasteurised goats cheese crumbled on top, served with fine beans and broccoli. There are many excellent vegetarian cookbooks on the market today. Yoga books often give sattvic diet recipes.